Do you remember when the Coalition government got into power in 2010 and introduced austerity because the UK’s finances apparently were so dire that foreign investors would pull out their money if nothing was done? There was some truth in that, but of course the Tories only made things worse by taking money away from poor people (who would have spent it) and giving it to the rich (who didn’t do much with it), so the deficit has continued to rise. I’m mentioning this because the Chancellor of the Exchequer, Philip Hammond, has now abandoned Osborne’s fiscal rules because Brexit is forcing him to do so. This means that the deficit is likely to rise dramatically soon, but without seeing the improvements that borrowing to invest could have led to without Brexit. The pound is already falling like a stone, but once the financial markets fully realise that the UK is heading for a hard Brexit (and Theresa May was very clear about this on Sunday, as I’ve discussed before), and once they’ve factored it this ballooning deficit, it’s likely to fall even faster. I’m also very concerned that the Treasury seems to be contemplating to pay compensation to companies for losses caused by Brexit if they remain here. On the one hand they have to do so to prevent all exporting companies from leaving before March 2019, but on the other hand the money for doing so can only come from printing even more money, which isn’t going to be good for the exchange rate. Of course the pound will stabilise at some point, but it can fall a lot before that happens, and there won’t be many well-paid jobs left at the end of it. 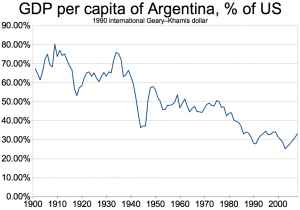 Perhaps things won’t be that bad, but I’m starting to think the UK could go the way of Argentina, which over a hundred years fell from being on the same level as Germany or France, to a point where their GDP per capita is less than 30% of the USA’s (see the adjacent graph). Unless the majority of non-Brexiteers in the House of Commons get their act together and kick out this mad government before it’s too late, Scotland has to get off this sinking ship fast or we’ll get dragged down with it.